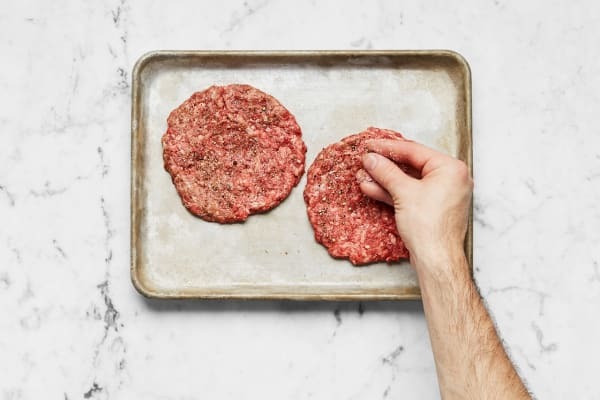 If you’re serious about your cheeseburger, we’ve got the goods: a juicy pan-seared beef patty enrobed in melted cheddar and topped with chili onion relish, all in a toasted potato bun. Have we mentioned the pile of thick and crispy steak fries on the side? Hungry yet? Adjust rack to top position and preheat oven to 425 degrees. Wash and dry all produce. Cut potatoes into ½-inch-thick wedges (like steak fries). 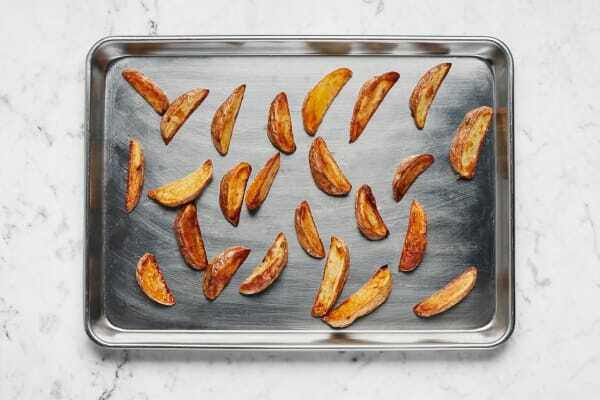 Toss on a baking sheet with a large drizzle of oil, salt, and pepper. Roast, flipping halfway through, until browned and crispy, about 25 minutes. Meanwhile, thinly slice onion. Heat a large drizzle of oil in a large pan over medium-high heat. 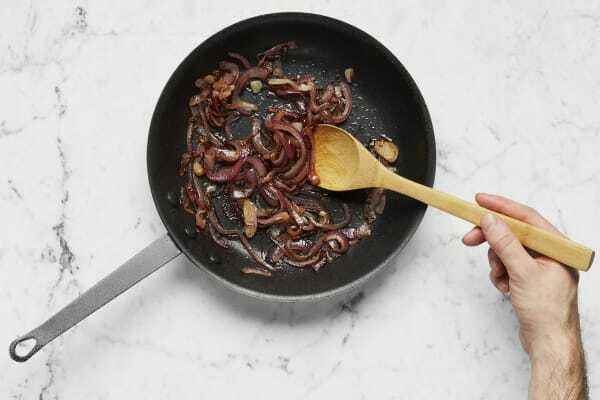 Add onion and cook, stirring, until lightly browned, 5-7 minutes. Stir in ¼ cup water. Continue to cook, stirring, until liquid has evaporated, 3-5 minutes. Repeat twice more, adding ¼ cup water and stirring until liquid has evaporated, 6-10 minutes more. Stir a final ¼ cup water (you will have added 1 cup total), tomato paste, 2 tsp sugar, 2 TBSP butter, and half the chili powder into pan with onion. Cook 3 minutes. Stir in 1 TBSP vinegar. Season with salt and pepper. (Add a splash more vinegar if desired.) Transfer to a small bowl. Wipe out pan. Heat a large drizzle of oil in pan used to cook onion over medium-high heat. Add patties and cook until browned on the first side, 3-5 minutes. Flip and cook until almost cooked to desired doneness, 1-3 minutes. Evenly top with cheddar. Cook to desired doneness, another 1-2 minutes. Meanwhile, halve buns. Toast in oven until browned, 3-5 minutes. 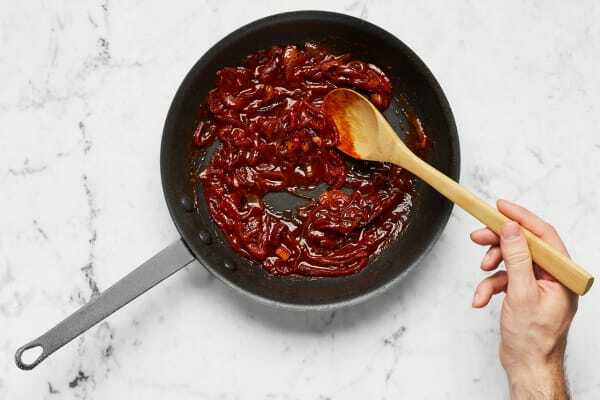 In a separate small bowl, combine ketchup and remaining chili powder. 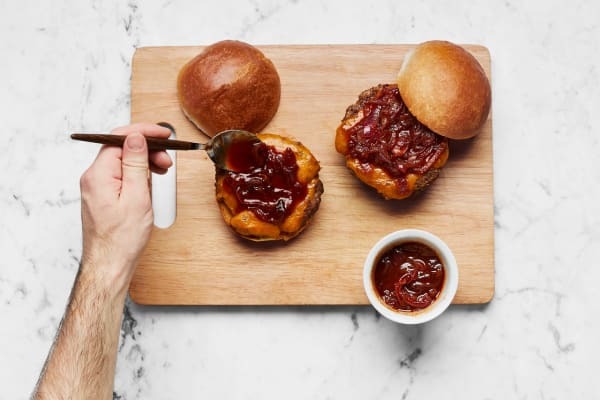 Divide patties and chili onion relish between toasted buns. 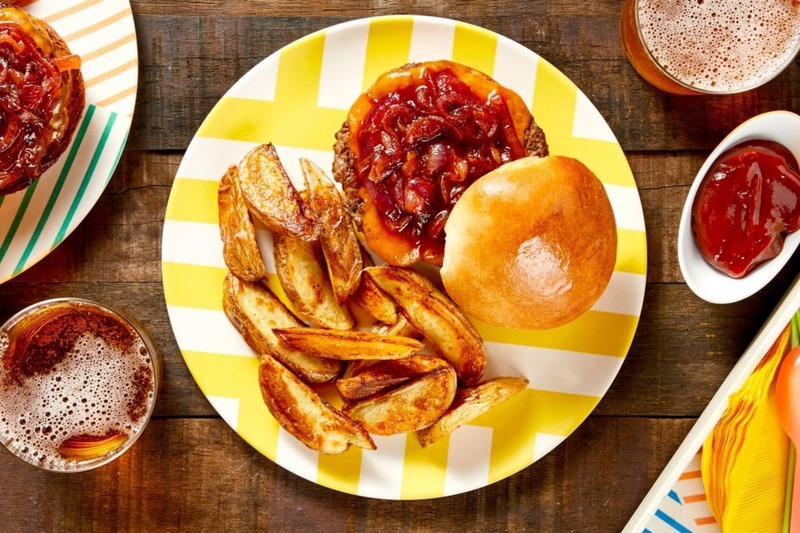 Divide burgers and potatoes between plates. 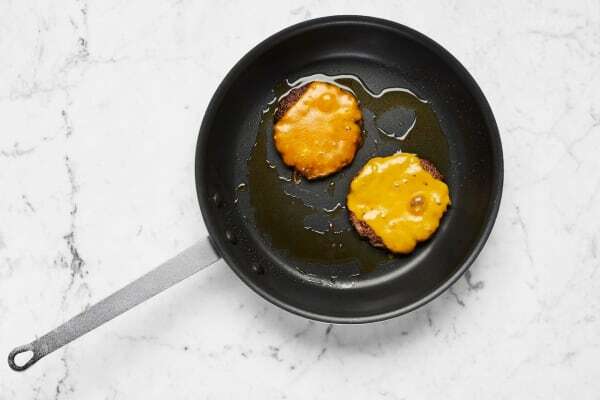 Serve with spiced ketchup on the side.